Funnily enough most will forget the discomforts of December revelry and once again find themselves standing in the VINTAGES section of the LCBO looking to refill those empty January shelves and wine fridges. While the extended holidays and New Year’s festivities may indeed serve to put a dent and a curb into spending, the undeniable urge to seek out values is mixed and matched by a commitment to staying a new year’s frugal course. The powers that be know their audience all too well and oblige by serving up more sub-$20 wines than at any other time of year. WineAlign covered the first half of the monopoly’s recurring redundancy of inventiveness last week with John Szabo’s VINTAGES Preview – Jan 5, 2019, Smart Buys under $17. Part Two goes at the next echelon of wines falling somewhere inside the vaguely specific $17 and $25 zone and then returns to wine buying reality by also exulting some pretty smart, higher end buys. Before we roll out the January 5th Buyers’ Guide Part, first a note on my recent trip to Argentina. It was only seven weeks ago that I had the favourable and fortuitous opportunity to travel around with the team at Wines of Argentina. I did not make Lionel Messi’s acquaintance but did experience first hand in Caminito and at the Buenos Aires Aeroparque Jorge Newbery the first leg of the Copa Libertadores final. I can only begin to explain the cacophony of roars when goals were scored during the intense rivalry between Boca Juniors and River Plate. The November trip took in Buenos Aires (including Recoleta Cemetery), Mendoza City, Luján de Cuyo (Agrelo), the Uco Valley (Gualtallary and Tupungato) and Salta Province (Cafayate and Calchaqui Valley). The journey will always be considered as a masterclass across Argentina because that is precisely what it was. Visits to Mendoza and Salta helped to gain a deeper understanding of solar radiation and its effect on high altitude wines. Please click on to read my full report. I tasted upwards of 150 wines in my week spent in Argentina. This report covers 37 wines from 37 producers. These are the 37 that struck me as being exceptional, ahead of the curve or simply the perfect sort of examples to speak about climate, soil and of course, altitude. Now onto our next set of recommendations for the January 5th release. 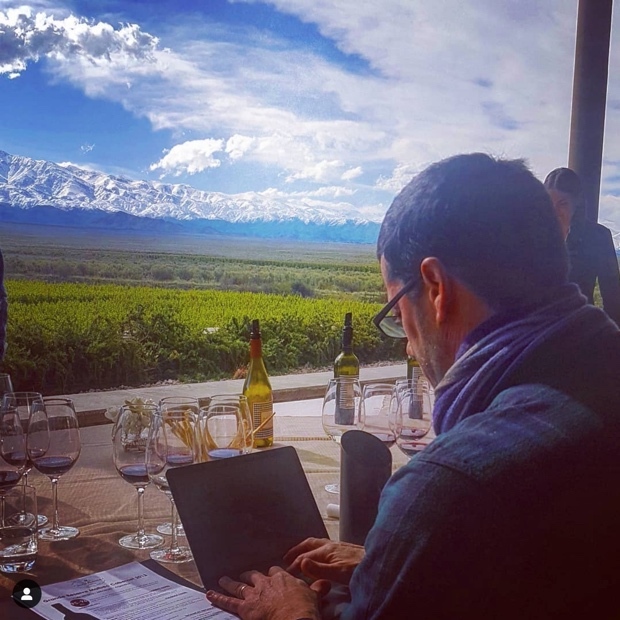 Michael Godel – Up to the northern clime of Calchaqui Valley, Salta we go for desert aridity, saltiness and a mineral streak through sun-ripened malbec. Here the temperature fluctuations between day and night seal in dark fruit and high acidity for the great solar radiated dichotomy. The Vesparo is a perfectly commercial poster child for the ideal. Michael Godel – Paraje Altamira continues to thrill and is poised to establish itself as one of Mendoza’s great terroirs. Here is a truly balanced malbec, as ripe and rendered as you’d hope for, with fine acidity and truly quality tannins. The interplay between the parts is playful and joyous, just intense enough to be considered tense and in the end it lingers long after the sip is gone. Not the thrill though. Sara d’Amato – An intense but balanced and fragrant high-altitude style of malbec from the diverse soils of Paraje Altamira at 4,000 feet of altitude. With distinctive floral notes and offering a firm tannic grip but a refreshingly moderate degree of alcohol. The oak treatment is elegant and doesn’t come close to overtaking the authentic black fruit flavours of blackberry and cassis. The malbec here is co-fermented with a small amount of cabernet franc and petit verdot planted in a single vineyard. A wildly complex find at a fair price. Michael Godel – Enchanted is a riesling meets sauvignon blanc joint with a portion of the latter re-fermented on the skins of dried grapes as per the Valpolicella Ripasso method. It’s quite concentrated, reductive and juicy with good balancing acidity. Well made and a winner for the house. Michael Godel – Wairarapa is a wonderful place to raise pinot gris as witnessed by this energetic Matahiwi. The nose and the palate deliver a pulse of pique to tickle both the olfactory and the gustatory. Fresh herbs and juicy pressed pear lead into a second half marked by herbal tisane and preserved lime. Sara d’Amato – A deliciously textbook grüner veltliner with more complexity than the norm. Offering authentic flavours of white pepper, slivered almond, orange rind, elderflower and a chalky minerality. Expressive and concisely made with good length. Somewhat angular yet still easy to enjoy. Great value. Michael Godel – From Celler Masroig, here is a nice little high acid Monstant with tobacco, baking spices and good red fruit. Tidy value for freshness with a medium bodied bit of fleshy drive. Michael Godel – Good solid savoury and graphitic cabernet sauvignon is a Colchagua specialty, here in concentrated and pinpointed form from Caliterra. It’s quite commercial and highly effective from a large contiguous plot of consistently ripened fruit. Solid food wine, especially for meats in pastry. John Szabo – here’s a deeply coloured cabernet, with solid aromatic intensity and complexity, also firm structure and well integrated wood, acids and tannins. I like the savoury black fruit and honest texture. Best 2019-2022. Sara d’Amato – After all of the heaviness of the holidays, I’m looking for a red with some freshness and ease of drinking and this merlot hits the spot. With lighter handed oak treatment and terrific balance, the wine offers an almost ethereal quality, avoiding the trappings of oak despite the relatively high alcohol level. I love the purity here and the opportunity to taste authentic, non-confected fruit at a reasonable price. Michael Godel – The depths of colour and sweet grained tannin are plumbed in this Paso Robles petite sirah, to little or less surprise. It’s quite tangy, tannic and full of varietal acidity. Sweet fruit builds and wood is very much a part of the mix. Faux confected without barrel heft and effective. Truly effective. “Tis a fun, dark and lightning stormy departure, kind of like a new world version of Castagnole Monferrato ruché. Sara d’Amato – A serious find for little dime, this petite sirah from Castle Rock had me double checking the price. A generous aromatic nose with notes of cedar and toasty wood gives way to dark fruit flavours on the palate with a lightly smoky edge and very good concentration. Michael Godel – Here the fine tannic structure of Haut-Médoc is acquiesced in a fair priced Bordeaux that delivers the stature and the goods. It’s a fine bit of Bourgeois architecture that builds from flesh and bones. Good fruit lurks behind a solid tannic wall brightened and lighted by high toned acidity. Sara d’Amato – If you haven’t had your fill yet of bubbles or if you are need of replenishing your supply, here is a terrific buy sure to satisfy your senses with its intensity and elegant savory edge. This family owned project from the Côte de Bar produces a stylish, wide-ranging portfolio at affordable prices and this entry-level non-vintage incarnation produced from 100% pinot noir is no exception. Michael Godel – La Pieve’s 2014 Barolo is quite tight, reductive and in command of its ancient terroir. It’s both a grippy and gritty nebbiolo with great structure, plenty of spice and a decade or two of life ahead. If you can’t imagine the potential tar and roses then you may not be paying attention. Earthy and spicy notes will help to define the future. Michael Godel – Once again I find Fèlsina’s 2015 sangiovese fresher than their ’16, or rather I should say that the ‘16s are possessive of so much structure that they will need more time in bottle than the transparent ‘15s. And yet here you will find the proof that 100 per cent sangiovese from Fèlsina’s Castelnuovo Berardenga soils need time and in fact solicit more patience than most. This combination of generous and gregarious fruit meeting formidable structure is a product of the commune, the micro-terroir and certainly the house style. The ’15 Riserva is recommended with the caveat to insist that a buyer be warned to exercise great restraint. John Szabo – A pure sangiovese, from 11 parcels across the Fèlsina property, multiple clones, aged principally in large cask with a small percentage (c. 10%) of old barriques to layer in additional complexity. The 2015 is maturing now, intense, offering spicy and savoury, resinous herbal character, old wood, a touch of volatile to lift the ensemble. It’s classically styled from the warmer Berardenga zone in the southern part of Classico district, with more than a touch of minerality-salinity. Best 2019-2025. Michael Godel – Pioneer for the Willamette brings a posit tug between ripeness and tension for pinot noir to make you think and feel. You can’t have one without the other so embrace the dichotomy and appreciate the history, acumen and grace. It’s the real deal. John Szabo – This is a classy and composed, really pretty Willamette pinot from Adelsheim, open, ripe, complete and complex. It offers a fine mix of both red and black fruit, gentle spice, minimal oak influence and some intriguing earthy, leafy, twiggy notes. The palate is nicely saturated with more of the same flavours, presenting silky, well-managed tannins, balanced acids and excellent length. Best 2019-2026. Sara d’Amato – Although this is far from being the most exciting VINTAGES release of the year, there are some gems to be found including this delicious pinot noir from Adelsheim. Authentic flavours derived from a non-interventionist style of winemaking are offered. Despite a moderate alcohol level, the mouthfeel is satisfyingly round. Michael Godel – Many believe you can’t go home again and this 100 per cent sangiovese is one of the original locals, along with 11 (or more) Super Tuscans that in many ways are no longer, nor for arguments’ sake should be. This is an exceptional Cepparello, seamless, blessed of pure, perfectly phenolic fruit, unblemished, stylish and with pitch perfect acidity. Feels like home. John Szabo – The estate’s top wine Cepparello is named after the dry creek that runs through the Isole e Olena property, and Paolo dei Marchi’s 2015 edition, pure sangiovese, is a magnificent wine, complex, complete, with extraordinary texture, finely woven, firm and tensile. It features ripe, red and mostly dark fruit, along with a rich, intense, and structured palate, full-bodied, savoury and succulent. Still far from prime, I’d cellar until 2025 for maximum enjoyment, or hold another decade post that. Best 2025-2035. Thanks for reading and if you’ve not yet had a chance to slide over to my article on Argentina, here is that link. David and John will return over the next two weeks with previews for the VINTAGES January 19th release.